Last week, our state launched the California School Dashboard with the goal of creating a new way to measure school quality and monitor student achievement. While the goal of capturing more detailed and nuanced information about student performance is a step in the right direction, there is more work to be done to improve the current dashboard. This dashboard looks at several statewide student indicators to better understand how all students are progressing towards college and career readiness. The hope was that viewing student progress through multiple measures would provide a greater understanding of where students were experiencing success and where needs were not being met. However, the chosen indicators and depth of data fall short of providing families the information that they need to make choices for their children and see a complete picture of how schools are doing. The six state indicators are: chronic absenteeism, suspension rate, English Learner progress, graduation rate, college and career readiness, and academics (English, Math). How was school quality measured in the past? Many of us are very familiar with California’s previous school accountability system, known as the API or Academic Performance Index. Under the former system, which was discontinued starting in 2014, school quality was measured through state testing; each school was assigned a numeric value based on test outcomes with the goal of all schools exceeding an API of 800. This simple metric was an absolute performance value that assessed a moment in time in the life of a school, and combined student academic achievement in Math and English Language Arts. Therefore, many felt that the API was an incomplete measure of school quality that oversimplified progress and student needs. Click here to view school API information from 2013 and earlier. How does the new dashboard measure student performance? 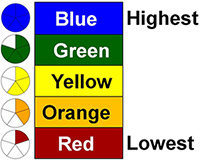 It summarizes student performance levels in each indicator from low to high using a color scale from red to blue, as displayed below. 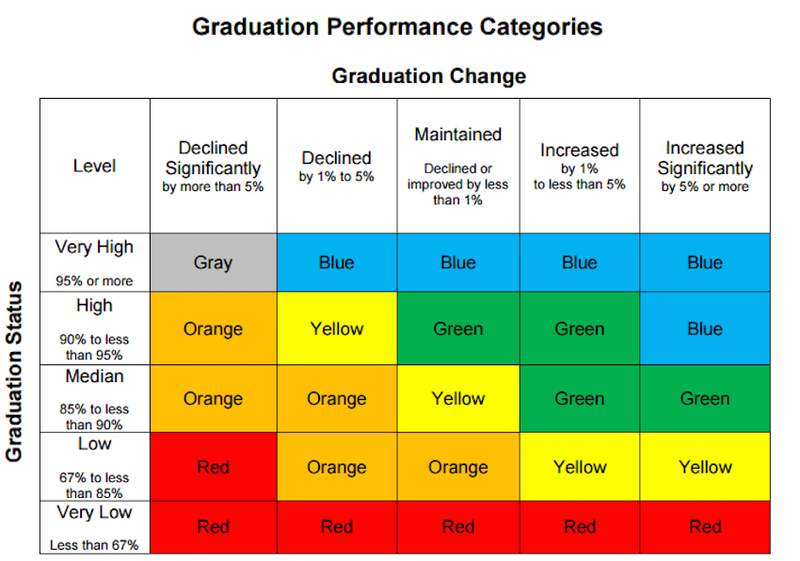 A color is assigned to an indicator based on a combination of two key pieces of information: (1) Status, how students are currently performing, and (2) Change, how performance has changed compared to performance the previous year. The dashboard combines information about student proficiency and growth using five-by-five reference charts. The charts show how districts or schools are making strides forward in service of students, and also highlights those that may appear to be strong in terms of absolute numbers, but in a multi-year context, have experienced a decline or minimal growth in student progress. Below is the reference chart for the Graduation Rate indicator. It takes into account the overall graduation rate and how the current rate compares to data from the previous year. WCCUSD’s graduation rate was 84.7% in 2014-2015 and 90.4% in 2015-2016. Therefore, the dashboard assigns a blue performance level to our district for 2015-2016, representing a High (90-95%) Graduation Status and a Change that has Increased Significantly (by 5% or more). An example like this demonstrates how California’s new school quality system provides communities and district leaders with more information about how our students are doing. However, it also demonstrates the flaw in the current system — a school can earn a green performance and yet only be performing in the Median band with a minimal increase in performance (1%). While we now have a more complex scale for progress that monitors student outcomes over time, the scale is potentially overly complex scale. Since each five-by-five reference chart defines the values for Status and Change differently, each color can mean very different levels of student achievement. In the grid above for example, schools that earn an orange or yellow performance level could have a graduation rate anywhere between 67% and 95% — this is quite a large range. The current dashboard must be improved in order to adequately support districts in making evidence-based decisions about resources and programming to close achievement gaps among students from different backgrounds. Our families and communities need more clarity about the chosen indicators in order to truly understand students’ learning experiences and identify high-quality programs and schools. Stay plugged into our emails and website over the next weeks as we explore the new dashboard and deep dive into the new indicators that evaluate our students’ progress to success in college, career, and life! California Department of Education provides a set of resources for parents and other stakeholders, including a video overview, PowerPoint tour of the dashboard, and flyer. EdSource has created a searchable and sortable chart that allows you to see all of the schools by city, county, and school district to compare student performance. Ed100 has a five-part blog series deep-diving into the new school dashboard. Contact The Education Trust — West to provide your feedback about the dashboard.